Own a piece of Moorestown History! Moorestown, New Jersey is pleased to announce the upcoming construction of PERCHERON PARK at the intersection of Main and High Streets in the Town Center. The park will celebrate the town’s agricultural heritage and commemorate the historic first shipment of Percheron horses from France to the USA in 1839 by Moorestown native and gentleman farmer Edward Harris II (1799-1863). The Percheron became the predominant draft horse breed in America because of its spirited but docile temperament, strength, and stamina, in both farming and hauling. Harris’ home, now called the Smith-Cadbury Mansion, at 12 High Street, is headquarters for the Historical Society of Moorestown. The Percheron horse had a tremendous impact on the agricultural world. In 1839, when Edward Harris II introduced the Percheron horse to the USA from France, agriculture was a primary occupation in our town and country. Horses were the main source of motive power for farm and road use, and the English type horses being used here then were unsuited in size, strength, stamina, and temperament for the heavy-duty work required. Friends of Percheron Park is working toward that goal, 121 years after the suggestion! Soil remediation of Percheron Park at Main and High Streets is expected to be completed in time for an early spring, 2014 date for development of the park, sure to be a highlight in our Town Center. The park is a citizen-inspired initiative and invites everyone’s participation. 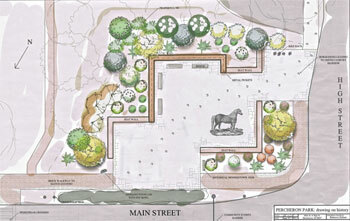 Design of Percheron Park was donated by Rebecca Zellner. Fabrication and installation of the temporary sign is courtesy of NW Sign Industries. Funding for the park will be provided primarily by private contributions and park grants. For further information about tax-free donation opportunities, click here. To become involved in this community-wide effort contact Friends of Percheron Park at percheronpark@gmail.com. Friends of Percheron Park is a non-profit, 501(c)(3) tax exempt corporation formed to manage the fund-raising and construction of the park. In 2006, an appeal was made to the citizens of Moorestown for their thoughts to help revitalize the Town Center area of Main Street. Around that time, there were a number of articles appearing in the newspapers about ideas that surrounding towns were implementing to draw visitors and residents to their fading town centers. What was unique about Moorestown that would entice people to come here? The idea was proposed to erect a statue of a Percheron horse in the Town Center to commemorate the first Percheron horses brought to our country from France in 1839 by Moorestown native Edward Harris II. No other town could lay claim to that history. The dilemma was to find a suitable location for such a statue. In 2007, when it was revealed that Moorestown was planning to purchase the 1 High Street site for possible use as a pocket park, things fell into place. What better way to celebrate Moorestown’s unique agricultural heritage and historic horse shipments than with an attractive Percheron horse statue gracing an intimate plot, in the center of town, just steps away from Edward Harris’ home! In 2011, several members of the Moorestown Garden Club provided impetus for construction of the park when they presented a landscape plan to Town Council for their approval. That plan will be carried out when the soil remediation is completed. and appears on the state flag.